Special Compass is an educational service centred for students with Learning Disabilities and special needs. Habitually, the term “Learning Disability” has a negative connotation that stereotypes and isolates; individuals are left to deal with their conditions in silence. Often misunderstood, those diagnosed, frequently bear the stigma of being thought of as “slow,” lazy, or “weird.” At Special Compass, we advocate for the unique abilities and skills of those individuals with a Learning Disability. We believe that your mind is the most powerful tool you possess. If you can think it, you can achieve it. 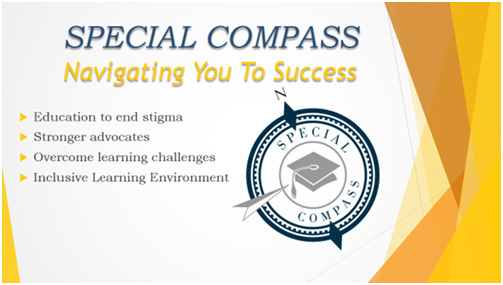 Our goal at Special Compass is to equip students, individuals, educators and parents with the tools to empower themselves so that they are not limited by a model of learning that is not inclusive of students’ unique needs. With the right tools and teaching guides, a student with a Learning Disability can have limitless possibilities for their success. Our model is that no student should be left behind. We’re here to help, to guide, to advise, and connect. Special Compass is a proud ambassador for National Diversity and Inclusion Day. Special Compass is an educational resource centre for students with learning disabilities and other special needs. Founded in 2015, our mission is to be that bridge between special education and general education to help create inclusive learning environment so students with learning disabilities can navigate to excel academically and personally. Through education, we work with our clients to help prepare them for major transitions in their academic career. Help parents become better advocates for their son or daughter. Strengthening students and parents to become proactive and overcome their learning challenges. Navigating You To Success is our job!